Your child goes through so many stages. First, there’s the crawling stage and then the walking stage. After that, your child slowly moves in to the Terrible Twos and the Terrifying Threes. Although it’s relatively easy to recognize when your child enters the Terrible Twos stage (just look for the tantrums), it can be hard to know when your child is ready to enter the potty training stage. 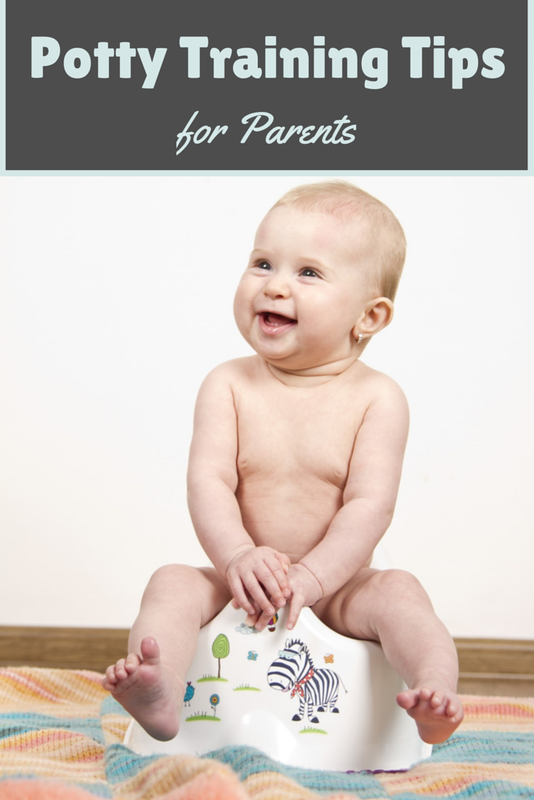 If you have a toddler at home, here are some tips you can use to know how to start potty training. Although you might think your child is old enough to start potty training, how can you tell your child is actually ready? If you're thinking about starting the potty training process, you need to look for a few signs that your child is ready. One great sign is if your child is able to say “pee” or “poop” before or even after they go in their diaper. Your child might also be ready if they want to be changed out of a dirty diaper and into a clean one. Another great sign is if you have to change your child’s diaper less often. This indicates that your child is starting to control their bladder, which is good news once you switch over to pull-ups or underwear! When first starting to potty train your child, you might want to set a timer. Timers are great for reminding your child (and yourself!) to stick to a regular potty schedule. Start with shorter intervals and each time the timer goes off, your child will need to run and try to use the potty. You can slowly set the intervals further and further apart as your child gets used to dropping everything to use the bathroom. Eventually, you won’t need to use the timer as your child starts to use the bathroom on their own. A potty chart is always a good idea, no matter where you are in the potty training process. If possible, buy a chart you can hang in your bathroom. The chart should be at eye level with your child so that they can become involved in marking it. To start off, you should let your child put a sticker or magnet on the chart each time they use the bathroom. This will help encourage your child to use it more often so that accidents are less likely to occur. As your child grows in the potty training process, you can use the chart to help mark days and even weeks without accidents! Don’t forget to reward your child for a job well done! Each time your child goes to the bathroom, they should get a reward. This can be a verbal reward as you congratulate your child for sitting on the potty, or it can be a small toy or piece of candy. If you’re using a potty chart, you can set goals so that your child earns bigger and better rewards the longer they go without an accident. One of the most important tips you can remember as a parent is that accidents happen. You might think your child is a professional at potty time one day, but the next it seems like they have nothing but accidents. This happens, either because your child simply drank too much juice or because they’re still learning to listen to their body. Regardless of the reason, remember to keep your cool when your child has an accident. Help them get cleaned up and try to take a few extra bathroom trips throughout the day. Potty training can be difficult, but these tips are bound to get you started on the potty training process! What are some tips and tricks you used to help potty train your children? Great tips and I admit I am just so happy that we are past this stage here to be honest though. These are really great advices I wished I read when I was potty-training my girl. I was clueless when she was in that stage and it was an ordeal for us. A potty chart would have been really perfect. Have a great day! Wonderful tips Amanda! We're almost past this stage. Almost. The key is making sure THEY are ready. It makes the toilet learning process so much easier. These are really great tips!!! Jaiden is the one who told me he was ready and the second he went, diapers went out the door and undies came on in! It was a fun thing for us! I got so lucky and he never had any issue with wetting the bed! =) Thank you so much for these tips!! Great tips! It took my nephew quite some time to be fully potty trained and my niece is now 3 and we're still struggling with her. They'll only go when they're ready so I hope she's ready soon. Great tips! All three of mine are finally trained for the most part,still working on nights for my youngest. All of mine love getting a mini m&m when they went potty. We started potty training each of our children at 18 months old. I started out with handing them a small amount of soda watered down or juice and getting them to just sit down for 10 minutes on the potty, and eventually not too long after beginning, they caught on to the idea. And of course we gave M & Ms as treats for going and such. I had them completely trained with naptime and bedtime by 2 and 2 1/2. We took pull ups away not long after 19 months old. Accidents happen, that's why they invented washing machines and they were used often, but they got the hang of it after a bit but we took longer with going out places in underwear. When I potty-trained the little one I used to watch, we had "targets". They were these little bio-degradable rings that you could throw in the toilet, so he could learn to "aim" LOL Those worked really well! My son was easy to train he just sort of decided one day he didn't want a diaper on anymore. It was so funny he walked up me and stated he was a big boy and that was it. I have never had to potty train a child since I don't have any. I can't imagine it is very easy. All those tips above should help I would think. We are still at the thinking about it stage. Jemma just isn't ready. For the other two, I waited until they told me they wanted to go on the toilet and then worked hard from there. If we are pushing too much we may get disappointed. Pun intended!